In a chaotic and stressful world, it is often difficult to find effective and fun stress relief toys. However the ones that work best include games and relaxation toys. Everyone hears a great deal regarding the detrimental effects of long-term video game use on the health and psychology of children. However, little is known regarding the positive health and psychological effects of casual video games used as stress relief toys. In fact, evidence from studies suggest that moderate video game use reduces stress and anxiety, and helps to alleviate depression. With the new Wii console system that incorporates physical activity into video games, the health benefits are now that much greater. Overall, the study showed conclusively that the casual playing of video games has significant psychological and physical benefits. This means that video games are on the top of the list of stress relief toys. It should be noted that the negative health effects of video game addiction are also significant, and should always remain an important concern. While massage remains classified as an "alternative medicine" in the medical field, research shows both short and long term health benefits from massage. A study published in the International Journal of Neuroscience demonstrated that massage therapy helps to improve concentration and mood, reduces depression and feelings of anxiety, and increases alertness. This research proves that there are both short term and long term health benefits of massage. 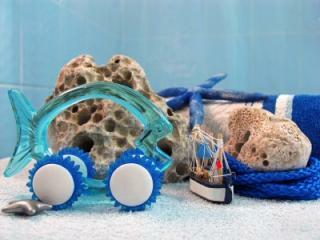 There are a number of stress relief toys that provide the health benefits of massage. Many of these are used to provide therapy for children with disabilities, however they can be used by anyone looking for stress relief toys to help reduce anxiety. Handheld mini massagers - These little toys come in a variety of colors, shapes and sizes - even including bug and animal shapes. Easily grasped in one hand, the four rounded "feet" provide soothing vibrations. Plush massage toys - Plush toys and stuffed animals provide soothing massage to whoever holds and squeezes it. These unique toys are ideal for very young children. Massager pillows - Massage pillows come in every shape and size. Smaller pillows with a strap are for hand massage. Larger soft massage pillows provide soft and soothing vibrations for your back and neck. Foot massagers - Various forms of foot massage toys are available as both massage pillows and as the classic water-filled massage foot baths. Foot massage provides so many health benefits that an entire research field, called foot reflexology, exists to study it. Meditation is one of the most powerful ways to reduce stress and alleviate tension throughout the body. The reasons why meditation works so well is little understood by science, however research indicates that regular meditation has tremendous health and psychological benefits. Jon Kabat-Zinn of the University of Massachusetts Medical School monitored brain waves of high-tech employees in Madison, Wisconsin as subjects learned meditation over the course of eight weeks. The results, published in a 2003 issue of Psychosomatic Medicine determined that employees who completed meditation lessons experienced a significant shift of brainwave activity from the stress-prone right frontal cortex to the calm left frontal cortex. These results offer powerful evidence that meditation provides more stress relieving benefits than almost any other activity. There are a variety of toys that help to teach and encourage a calming state of meditation. Many of toys can be used by children or adults to help induce a state of mind where thoughts and attention is completely focused on a single activity. This intense focus creates the healthful meditative state. Zen garden kits - Zen garden kits come in every variety, for both adults and children. As you carefully arrange polished stones and objects in the pure white sand, an enlightened sense of well being and focus gradually soothes the stress-filled mind. Rubix Cube - Puzzles that exercise the mind create a state of meditation where the mind becomes focused completely on the task at hand, shoving aside the stressors of daily life. Research indicates that regular mind exercises such as the classic Rubix Cube delays or prevents dementia during old age. Crosswords and Scrabble - Crosswords are a similar form of meditation as puzzles which focus the mind, but crosswords also incorporate the linguistic part of the brain which improves vocabulary and writing. Scrabble is a stress reliever game that introduces a concept of "mutual meditation" where two people are focused on a similar activity, with two minds connect in a shared meditative state. One of the most powerful methods you can use to relieve stress and counter the damaging effects of stress on your health is to make use of stress relief toys on a daily basis. The resulting psychological and health benefits will last a lifetime.